Gately Cadillac Restoration has traveled the country in our 10 wheeler many times to bring you some of the rarest Cadillac parts. Rust free Cadillac parts from California, to Arizona to Florida and back to Massachusetts. We have been doing this since 1960. Over 50,000 Cadillac parts, most of our parts are stored in our warehouse. Gately Cadillac Restoration also sits on a Cadillac junk yard in which we have stripped over 300 Cadillac's over the years. Cadillac parts for antique and vintage Cadillacs. 1941 - 1949 rare and hard to find parts. 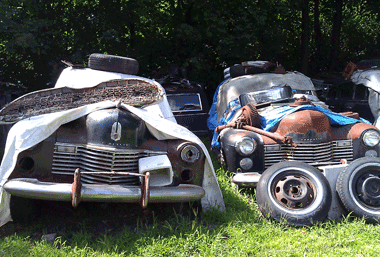 We have parted many 1941 Cadillacs over the years and have stored these parts in our warehouse. 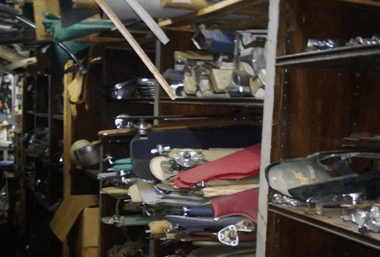 Gately Cadillac Restoration has parted out hundreds of 1950s through the 160s Cadillacs. 1959 - 1960 rare and hard to find parts. We have traveled the country many times to California, Arizona, Texas, Florida and of course Hershey, PA in our 10 wheeler International truck. Gately Cadillac has some rare and hard to find parts in goo original condition resting in our warehouse. Rare and hard to find Eldorado, Fleetwood and Cadillac limousine parts including rust free quarter panels and hard to find molding. 1961-1964 hard to find rust free Cadillac parts for Eldorado's, Fleetwood's, and Series 62 convertibles. We have your parts in stock and in very good condition. We have traveled the country many times to California, Arizona, Texas, Florida and of course Hershey, PA. Gately Cadillac has some rare and hard to find parts in good original condition resting in our warehouse. Rare and hard to find Eldorado, Fleetwood and Cadillac limousine parts including rust free bumpers, decks, hoods, grills, engine part and interiors. 1965-1968 hard to find rust free Cadillac parts for Eldorado's, Fleetwood's, and Sedan DeVille and Coupe DeVille convertibles. Gately Cadillac has some rare and hard to find parts in good original condition resting in our warehouse. Rare and hard to find Eldorado, Fleetwood and Cadillac limousine parts including rust free fenders, quarter panels, tail lights, inner fenders, head lamp bezels and hundreds more. 1969-1970 hard to find rust free Cadillac parts for Eldorado's, Fleetwood's, and Sedan DeVille and Coupe DeVille convertibles. Lots of Cadillac sheet metel from all over the country. Gately Cadillac has some rare and hard to find parts in good original condition resting in our warehouse. 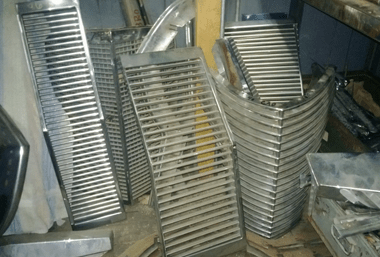 Rare and hard to find Eldorado, Fleetwood and Cadillac limousine parts including rust free fenders, quarter panels, tail lights, inner fenders, head lamp bezels and hundreds more. Classic Cadillacs Parts for sale. 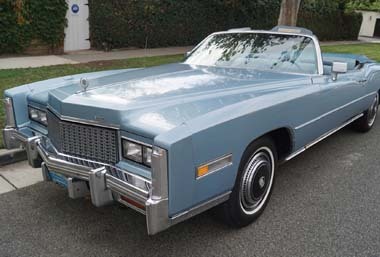 Eldorados, Sedan Deville, Coupe Deville, 1976, 77, 78, 79 and 1980 Cadillac Seville hard to find rare parts. many convertibles and coupes, some odd Cadillac limos & hearses, thousands of moldings, lights, grilles, bumper sections, molded door panels, dashboards, glass and interior trim, all mechanical components, switches, engines, transmissions, steering & brakes. Over 75 complete Cadillacs in my graveyard, rusting in peace, and more than 300 Cadillacs parted out and warehoused in downtown Boston.